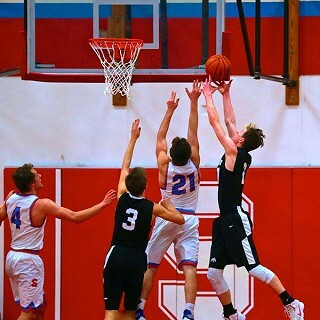 The Oregon West League proved to be the toughest league in the state, and as a result there were many good players throughout the league, and all-league voting was tough, so tough in fact, that the league voted to expand the voting. Senior Zach Anderson was a first-team selection, and senior Jack Berg earned second-team all-league. Zach averaged 11 points and six rebounds per game, while Jack averaged 12 points, six rebounds, and six assists. Noah Richards, Ryan Waddell, and Brad Eagan were all honorable mention and were added later. Noah averaged nine points, three rebounds, and three assists per game. Ryan averaged eight points and five rebounds, and Brad averaged four points and four assists per game. Coach Rand Runco said, "Really, all six of our top players deserved mention. Those six seniors played almost 100 percent of the games and did an amazing job! They got third in our league and made it to state. This was an unusual team in which six players played so well together and were a true unit. "Two of our league losses this year were when two of those seniors were out," added Runco. "Jude Carhart was also a key player for us and wasn't mentioned. He contributed big plays in games and had three steals almost every game." Runco told The Nugget it was one of his most enjoyable seasons as a coach. He stated that his players were great kids with great parents and he will miss them. "These guys gave everything they had, and had each-others and the coaches backs at all times," said Runco. "They competed so well against the toughest teams in the state. They went through some setbacks and made it to state, which is the fifth time in five years. They're an amazing group, and I was proud to coach them." Lady Outlaws players Isabelle Spitler and Sydney Head were both selected to all-league teams this year; Spitler a second-team pick and Head an honorable mention. Spitler (senior) was a shooting guard for the Outlaws and led the team in scoring. She averaged 8.2 points, 1 assist, and 1.5 rebounds per game. Isabelle scored in the double-digits six times during the season, with 18 points as her high-point game. She shot 26.8 percent from behind the arc and shot 39 percent from two-point land. "Isabelle has been a great leader for our team on the court, and possesses a high basketball IQ, which also helped her teammates be successful on the court," said Coach Brittaney Niebergall-Brown. "We are very proud of her for earning the award for second-team all-league." Head (senior) was an honorable-mention selection. Sydney played at both guard and at post for the Outlaws. She averaged 2.2 points, 1.5 assists, and four rebounds per game. "Sydney has continued to improve immensely throughout the season," said Niebergall-Brown. "We could always count on her to score a few points, pull down quite a few boards, and deliver the ball where it needed to go. She is a well-rounded player who consistently contributed positively to our league games. She is another great senior leader on and off the court, both with her skills and her work ethic. We are very proud of her award for honorable mention."